The collage above is by Anne-Marie Hood. 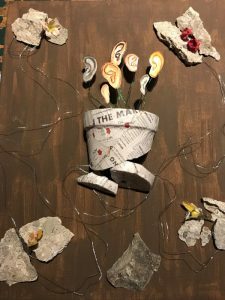 Artist Statement: What is growth? What is change? And how often do we misinterpret resonance with our own beliefs for growth? Perhaps it is time for a truly new approach where new ears take in sounds made up of the unfamiliar, singing unknown songs in unknown worlds. Since the release of the Canadian federal government’s 2018 gender budget at the end of February, there have been dozens of follow-on announcements about initiatives designed to advance women entrepreneurs and women-led enterprises from all sorts of organizations across the country. On March 6, the Ontario provincial government added its voice and announced that it will also be investing in improving support for women entrepreneurs by launching a new set of initiatives that will “help young women develop an entrepreneurial mindset” through the creation of the Ontario Women’s Entrepreneurship Association. To date, Ontario is the only province without a women’s enterprise centre or women’s entrepreneurship strategy in Canada. Sure. Canadian women entrepreneur advocates have already expressed concern that the money designated is long overdue and “not enough”. Many more critics are rightly questioning the implementation strategies. There is legitimate concern that unchanged parental leave pay and child care policies mean continued discrimination against startup founders and small business owners in an economy increasingly characterized by precarious employment gigs. In Ontario, leaders in the field are debating if launching a women’s entrepreneur association is the right approach or first step. Me? I still remember the Stephen Harper days. So, I am reservedly pleased with the initiatives our various levels of governments are pledging to undertake this year to advance gender justice. 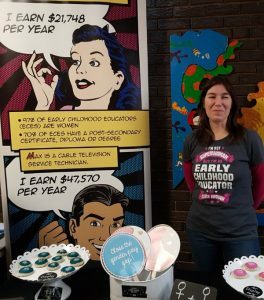 I also appreciate that in both provincial and federal budgets, women entrepreneurs are at least starting to be recognized as a distinct, large, economically vital demographic whose prioritized equality and equity needs are markedly different from those of our corporate sisters. On this, and to activist women entrepreneurs everywhere working to be heard, I say congratulations. It’s high time that your street-level, in-the-trenches voices finally pierced the routinely media-privileged corporate coterie that tends to dominate the women’s economic advancement public policy conversation. We just finished a week full of activities related to International Women’s Day worldwide. Feeling alright? Things heading in the right direction? Maybe. But not so fast. 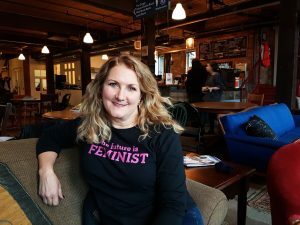 Welcome to the anti-feminist movement in Canada, as illuminated by Lauren McKeon, an award-winning Canadian feminist author and the current digital editor at The Walrus, in her fall 2017 book, F-Bomb: Dispatches from the War on Feminism. We felt this was an important book. So we commissioned LiisBethian CV Harquail to conduct a book review from an American feminist entrepreneur’s perspective. 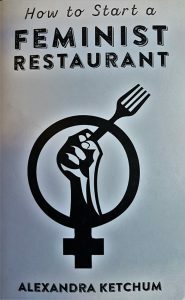 Harquail concurs with McKeon that “the anti-feminist movement remains strong and [therefore] feminists must find ways to be stronger.” Harquail suggests that this starts with trying to understand their limited world views and better yet, how other systems of oppression are shaping anti-feminist movements. What’s the best way to honour International Women’s Day and the art + activist women in our society who use pens, instruments, their bodies, and their voice to advance justice—often at great personal expense? Answer: Take the time to listen to LiisBeth’s Stand Up, Get Up playlist, curated by Aerin Fogel and featuring 10 women whose songs and performances help up see the world differently. 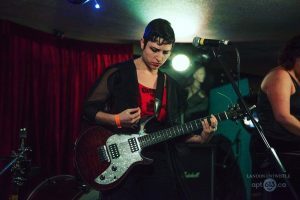 Fogel is a regular playlist contributor for LiisBeth, and founder of Toronto’s fall feminist music festival, Venus Fest. Listen here. 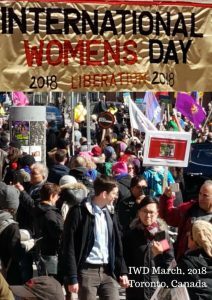 Highlights from Toronto’s International Women’s Day March on March 3, 2018. 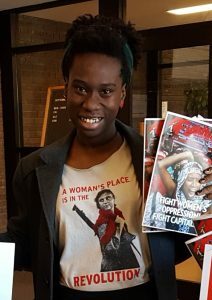 It was hailed as the largest IWD March in North America. 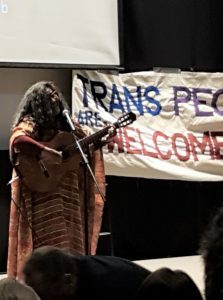 Toronto’s theme was liberation and justice for Indigenous women, particularly Tina Fontaine. We estimate approximately 3,000 to 4,000 participated. 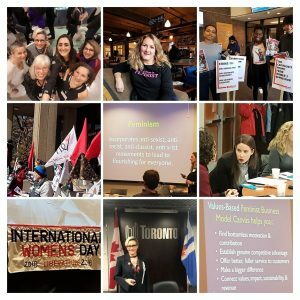 LiisBethian’s had a busy IWD week: the IWD march in Toronto, the SheEO Summit, several workshops on the feminist business model canvas, and a grand finale at the Social Innovation Bootcamp on gender and the economy held at the Smith School of Business at Queen’s University. Go team! 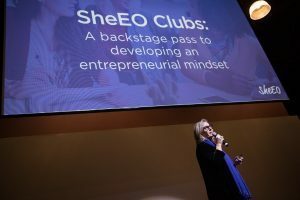 SheEO Entrepreneurship Clubs for Girls is coming to Ontario High Schools! When SheEO founder Vicki Saunders began her quest in 2015 to create a billion-dollar loan fund for women founders, there were naysayers galore. But no more. SheEO has found its stride. And then some: Starting this fall, SheEO will be launching entrepreneurship clubs for up to 1500 girls in Ontario high schools. Applications for the 2019 investment round will open August 2018. You can sign up to be notified when the application portal opens here! On Tuesday, March 13, LiisBeth had an opportunity to visit the new feminist bookstore in Montreal called L’Euguélionne. What a treasure trove! The store was well-stocked with feminist, LGBTQ+ and queer books, zines, pamphlets, and more (including this one featured above) in both English and French. The staff were super helpful and knowledgeable. We Say. Just. Go. 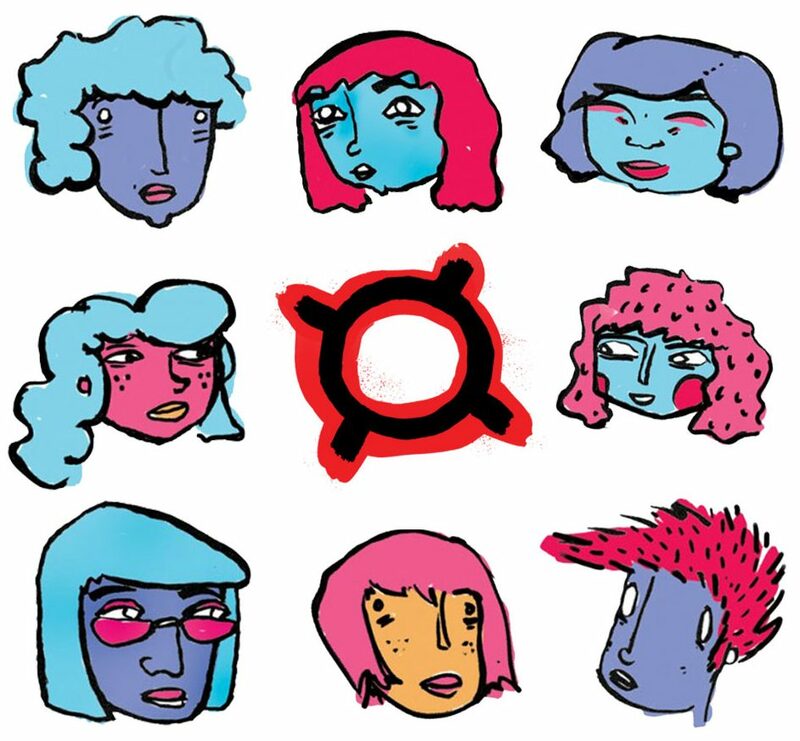 And if you are interested in what makes an enterprise feminist, check out this zine! 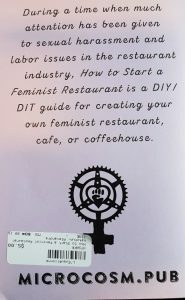 Alexandra Ketchum, author of the zine How to Start a Feminist Restaurant, says, “Feminist restaurants are spaces that take their food and labour politics seriously. They challenge the status quo…and provide a space for political organizing, recreational activity, and commerce.” Ketchum also holds workshops on the topic. To connect with her, visit her Facebook page. To learn more about feminist bookstores, read our feature story here. Calling LiisBethians in STEM: Is your business about A.I., Big Data, or 3D Printing? Innovative Solutions Canada is a new program with over $100 million dedicated to supporting the scale-up and growth of Canada’s STEM-based innovators and entrepreneurs by having the federal government act as a first customer. The program is designed to encourage government procurement from companies led by under-represented groups, such as women, Indigenous, youth, disabled individuals, LGBTQ+ and others. You can find more information here. Calling LiisBethians under 25! You might want to apply to the Youth Can Do It! 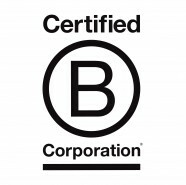 initiative where 25 diverse young entrepreneurs will be selected to come to Ottawa in June to connect with inspiring business experts who will support their journey forward. Can’t hurt, right? That’s it for our mid-March International Women’s Day roundup newsletter! Like what we do? Support us! It’s easy! Subscriptions are $3/month, $7/month or $10/month. We accept PayPal and credit cards. And we also now have a Patreon page! Funds go directly towards paying writers, editors, proofreaders, photo permission fees, and illustrators. Remember, there is no other feminist business media voice dedicated to supporting those looking to build and grow ventures in alignment with their feminist values. The next newsletter is scheduled for the end of March 2018. In the meantime, enjoy the better weather!